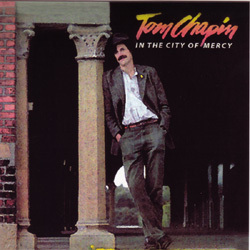 Tom Chapin"In The City Of Mercy"
Gadfly Records is proud to announce the first CD release of "In the City of Mercy" from folk troubadour Tom Chapin. The reissue is the first appearance of this album since its initial 1982 LP release. It includes nine folk/rock, pop/rock and soft rock originals, along with his studio version of brother Harry's classic "Circle." Chapin, known for almost three decades now as a hard-working road warrior performing 150-200 shows per year, has one of the most wide-ranging audiences in the business: from the younger generations who know him from his family recordings, to older folk and folk/rock aficianados who are more familiar with his adult-oriented recordings.